Only few people realized that Federal didn’t just produced mountain bikes, but a healthy dose of city/trekking bikes as well. And some of them are mixtes, by the Strobo moniker. Anggoro Inggriasto is one of the few that have the luck of getting his hands on one of them. Found accidently on the cart of a scrap metal scrounger, Anggoro decided to resurrect the Strobo as a commuter bike that retains the simple, clean, and classic look with the ease and practicality of modern components. 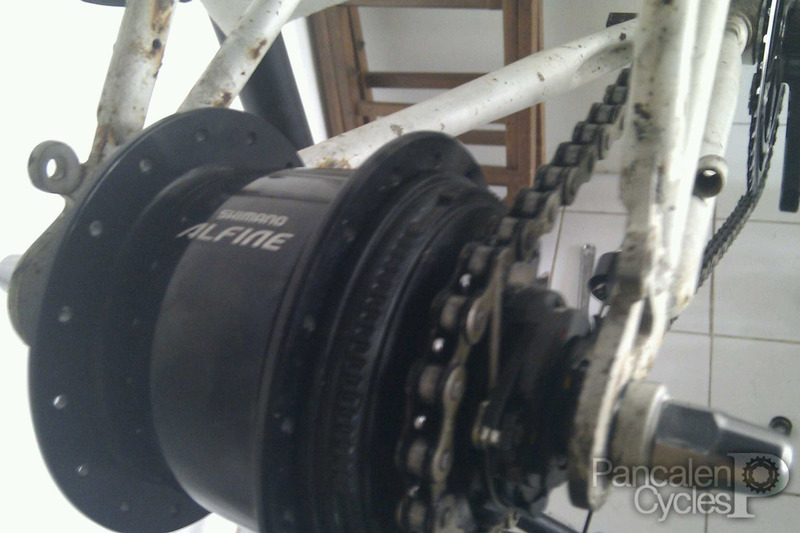 The answer is Shimano Alfine 8-speed internal geared hub. The initial drivetrain dry setup (that is, without wheels and such) was spot on. 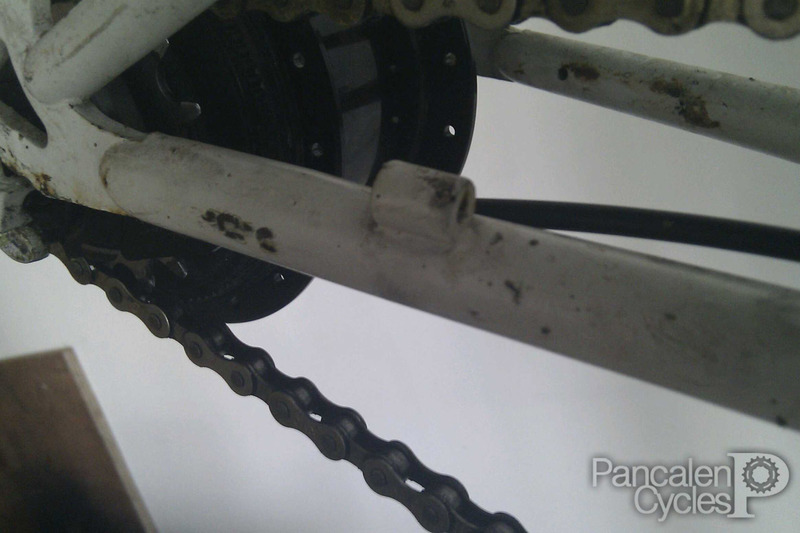 No problems found, we only respaced the rear dropouts to 135mm to fit the wider-bodied Alfine hub. The Alfine hub originally came with full-length shifter cable housing. We wanted to keep the “factory” look on the bike, so we decided to retain all the original cable routing. 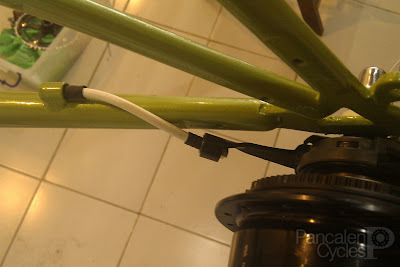 The shifter cable routing is exposed in some point, and as any bikes at the typical period it features a cable mount that was welded at the top of the drive side bottom bracket shell. We figured out that if we want to use this original cable routing, we have to move the rearmost cable stop forward about 45mm. 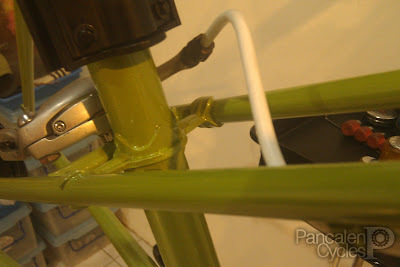 Since we’re going to repaint this bike anyway, that’s exactly what we did. ...so now we got a direct and clear routing from the frame down to the hub cable mount. To conform with the cleaner look, we also moved the rear brake caliper to the middle seatstay. You know, the one that connects to the headtube. This provides shorter brake cable routing and compliments the detail on the seatstay/seattube lugs. This build is still in progress as Anggoro is still falter between silver or black rims to go with the bike. Whatever it is, this is going to be an extraordinary build. Stick around for the next update!